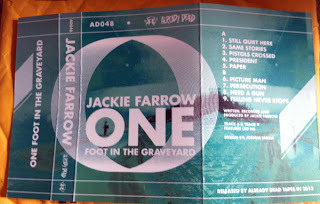 Jackie Farrow is a weird dude. 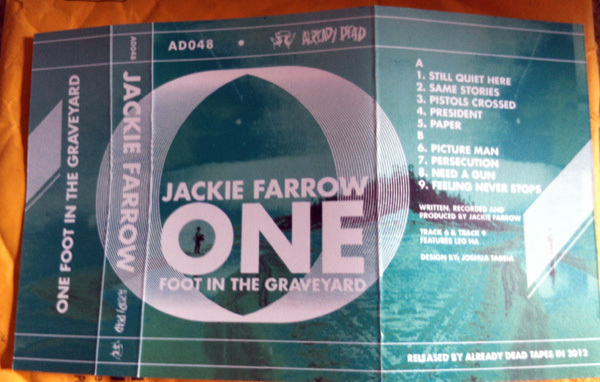 Okay, maybe Jackie Farrow isn’t even a dude. I don’t mean that in the way that I mistakenly said Vehicle Blues has a female singer (Sorry for that, by the way), but I mean it in the sense that this is a name that someone is performing under. 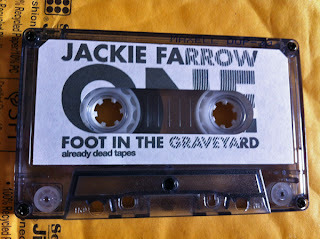 The first side of this tape, I like to call it Side A, begins with an audio clip from when JFK was shot. And now that I’ve typed that sentence, all I can think in my head is “JFK blown away WHAT ELSE DO I HAVE TO SAY”. Damn you, Billy Joel. Where was I headed with this? Oh yeah, at first I wasn’t really aware that the audio clip was for JFK, but I could take the little hints and clues and piece them together to realize that it was at least about the assassination of an American President and, well, JFK is one of the only ones that comes to mind because other than him I could only name Lincoln and I doubt Honest Abe had a radio broadcast on his death. As more audio clips show themselves during Side A, I can easily piece together that it is in fact about JFK. These audio clips are also called “President” and “Still Quiet Here”. Between Side A and Side B, the music is mostly rock n roll. It has that good old fashioned feeling that I really like to hear these days. It could be upbeat garage at times, and other times it slows itself down. The final song has a ballad feel that reminds me of Bob Dylan, Oasis (sadly) and Billie Joe Armstrong, while the first track on Side B reminds me of The Beatles mixed with “Title of Record” era Filter. 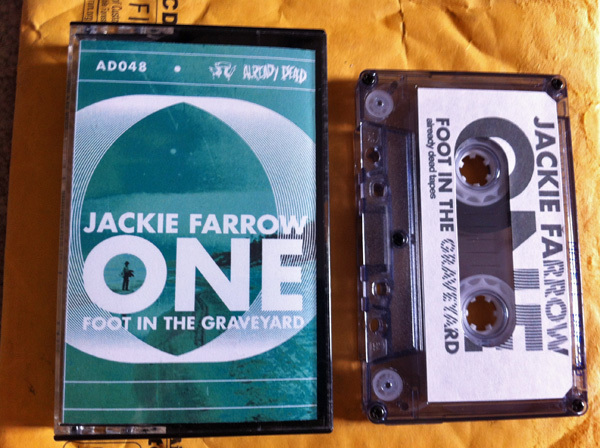 My favorite part about this cassette though is two songs- one from each side. I don’t want to diminish any of the other songs on here, because they are all quite pleasing and I even enjoy listening to a little piece of history, but in many ways I feel like this entire tape revolves around these two songs. For Side A, the song is called “Pistols Crossed” and on Side B it is “Need a Gun”. The fact that these two songs are on opposite sides yet share the similar theme in their titles is not really a coincidence to me, though I’m not really sure how to read further into it. They are also the two songs that on each side will grab you and really make you go, “I didn’t quite know what to make of this before, but now I know that I like it”.